So I had this concept. 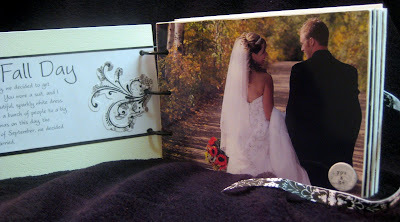 I really wanted to do a scrapbook of my wedding. Of course the options for this, and the type of album I wanted to make are endless. However, the phrase "one fall day" just came upon me and stuck in my head. 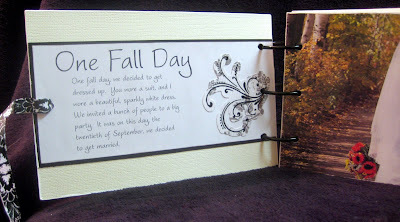 From that moment I knew I wanted to do a story telling scrapbook, one where I could look back and re-tell our story, about "one fall day"in september, plain and simple in nature, with our photos serving as the illustration to our story. Of course I really did not know how to go about this, and one night, when I had no time and had to go to bed because I had to work in the morning...inspiration hit. I had found the perfect papers and embellishments a while ago (Little Yellow Bicycle line....LOVE this) I just needed the inspiration and the idea to follow through. I dug through my stash, found a blank 7 gypsies 5 x 7 board book and set to work. In a few nights, the project was complete and has turned out to be one of my most favorite projects. I love the simplistic design, the papers, the journaling, the white painted edges, the embellishments...it just came together so nicely for me. It is amazing too, at how "little" a person needs to make a cute mini album. I really barely used much as I wanted to focus more on the pictures and words, less really was more for me. Anyways, just a quick share. Still working on more projects and our Mexico album. Gotta love it when those creative juices are flowing like mad! That album is simply GORGEOUS!!! What a great way to remember your wedding day! GORGEOUS!!!!!!!!! So beautiful, and what a beautiful story to tell!! WOW TOTALLY love this idea!! Beautful! 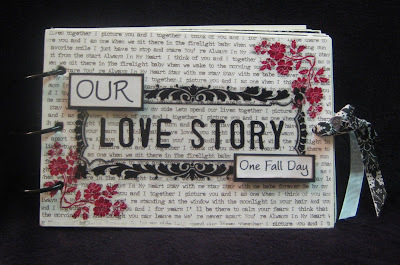 I love your Love Story album. It is so beautiful and original.